At present, I only have my most recent sketchbook with me, started in May this year, as all the rest are packed away in our storage unit in Whanganui, NZ. It's a hassle not having my resource sketchbooks on hand, but it's all part of the transitition of moving, I guess - we had no choice but to travel light! BUT, it's great when things like revisiting a place spark off memories. 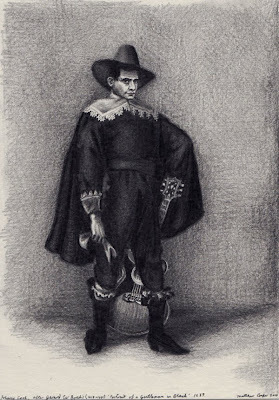 So I completed the drawing yesterday of Johnny Cash, after Ter Borch's Portrait of a Gentleman in Black c.1639, twenty-eight months after its inception. 'Johnny Cash (after Gerard ter Borch's 'Portrait of a Gentleman in Black', c. 1639. Coll. of The Palace of the Legion of Honor, San Francisco)'. Pencil on paper, 149 x 210mm. The image is full scale when clicked.